I am extremely grateful to Michael Cookson for passing this set on to me. 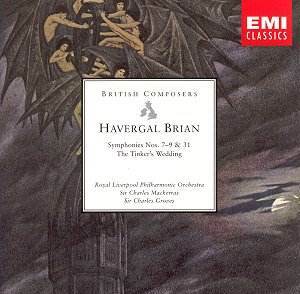 There remains much to fascinate in the later music of Havergal Brian: stuttering marches, tendrils of melody, suggestions made and then unmade, prism distortions and vague gestures. If you look for an accessible sense of symphonic continuity, of journey and homeland achieved, then you will come away empty-handed. Yet I retain the conviction that persistence dispels the fog - peels back confusion. To grasp the Gothic and the Tragica (No. 6) is within the capability of anyone who appreciates Sibelius, Prokofiev, Walton or Bax. Only after playing the Symphonia Brevis (No. 22) about twenty times did its 'logical' placement become evident - and this on a CBS LP where the performers were the Leicestershire Schools Symphony Orchestra conducted by Eric Pinkett. Other works by Brian will yield quicker rewards. The Violin Concerto played by Bisengaliev, the Third on Hyperion, the Second and Fourth on Marco Polo. The Fifth is a luxuriant pre-Raphaelite rhapsodic orchestral setting with baritone singing the words of Lord Alfred Douglas. The absence of the Fifth from the CD catalogue is keenly regrettable. After the masterful and concise Sixth Symphony Sinfonia Tragica (gloriously done by Myer Fredman and the London Phil on a long-deleted but still covetable Lyrita Recorded Edition LP) and the transitional Seventh, the symphonies become kaleidoscopic screes, sphinx-like, enigmatic mosaics of incident often grimly fantastic - sometimes mercurially furious. The Eighth fits this description to a tee. It is a symphony given an all-out performance here by Groves and the RLPO. Not once did I feel that this was a product of the hum-drum catalogue filler mentality. The Eighth is quite thorny going as also is the Thirty-First - his penultimate symphony. The Ninth harks back twenty years to Brian's Fourth Das Siegeslied with its hyper-Handelian grandeur, braggart brass flurries and confident march flourishes. Groves goads and whips his players along, at times achieving an effect similar to the nervous tetchiness of Boult's 1950s Vanguard-Omega performances of the Sibelius tone poems. The Ninth is the natural place to start among the single movement symphonies on this set. It has the least obscure symphonic outline as well as melodic material spattered here and there - offering an easier key to appreciation. The Groves disc was made during the analogue era and was the first major label LP of Brian symphonies in fully professional performances. It came out in 1978 as ASD 3486 and was then reissued in 1986 on midprice LP and cassette as ED290869 (EMI Greensleeves) The analogue hiss must be there somewhere but I couldn't detect it. The sound is superb and I am normally pretty impassive about these things. Here the brilliance well serves Brian's dark phantasmal escapades. The Seventh and Thirty-First were first issued in all three media (LP, cassette and CD in 1988) as CDC7 49588-2. The Tinker's Wedding joins the ranks of the British concert overture. It is a counterpart companion to the Sinfonia Tragica. Both are Synge-inspired pieces with the overture representing the snortingly uproarious and smashingly outrageous carnival of dissolutes while the Tragica draws its mastery and sustenance from one of the great tragic love stories, Synge's version of Deirdre of the Sorrows. The Seventh is an epic four movement symphony written in 1948 in the wake of the Tragica. The work was inspired by Brian's passion for Goethe�s writings and for the 13th century cathedral of Strasbourg. This is a work in transition. This has the bigness of the Gothic, and of the Second, Third and Fourth, the approachable theme-shaping of the Fifth and Sixth but is already beginning to succumb to the episodic trompe l'oeils and puzzles of the later shorter symphonies. Much as The Gothic has been analysed in terms of its cathedral allusions so this work has similar resonances. The themes do not have quite the memorable grip of those in the Tragica, Gothic, Third and Second but they are certainly there - from the tightly rippling opening fanfare to the skittering fantasy of the start of the adagio (tr 5 CD1) to the gritty victory of the finale which carried the superscription Once upon a time. Brian even finds time in this finale for the sort of singing solo violin (tr.6 8.25) we find in the first movements of the Gothic and the Third Symphony. The notes are by Brian expert Calum Macdonald, the author of the classic three volume study of the symphonies. The two discs come in a sensible slimline case. This set is not exclusively for Brian disciples although they will certainly want it for the first CD issue of symphonies 8 and 9. Any musical pioneer who wants five shots at penetrating the Brian myth would do well not to pass up this generous double. Determination is the order of the day but there are rewards here.